My older son, David, lives in Davis in northern California, and as I live in Los Angeles, I don’t get to see him very often. He works in the Physics Department at UC Davis and he builds things, like bionic arms for NASA. So when he said he was coming down for Christmas last year, I asked him if there was anything in particular he wanted for his gift. “You know what I want, Mom,” he said. He always asks for the same thing: a big box of Twisted Cookies, his favorite since he was a little kid. Twisted Cookies are made with a yeast dough and rolled-in sugar, which is folded over, rolled out, and folded over several times, producing a many layered cookie. I only make them at Christmas because they are so labor intensive. Well, I said, I can’t make those because everything in my house is covered with roofing debris and I have no surface to roll out the dough. So I asked what his second choice would be. He said he wanted Snickerdoodles. So I made a big batch and wrapped them up. When we opened our presents on Christmas Eve, he carefully opened the end of the package, assured himself that the cookies were in there, then carefully reclosed it. He whispered that he didn’t want anyone to see what he got, because he didn’t want to share. Just a little secret between a son and his mom. (By the way, this guy was born in 1970 and is going to be 41 years old this year.) lol. This Snickerdoodle cookie recipe is from the Betty Crocker Cookbook I inherited from my Mom that was published in the 1950s. The original recipe calls for 1 cup of soft shortening (part butter) and that is the way we made them back in the day. Using Crisco was probably a leftover method from the time during WWII, when butter was rationed. I went to all butter in the 1980s and have been making them that way ever since. 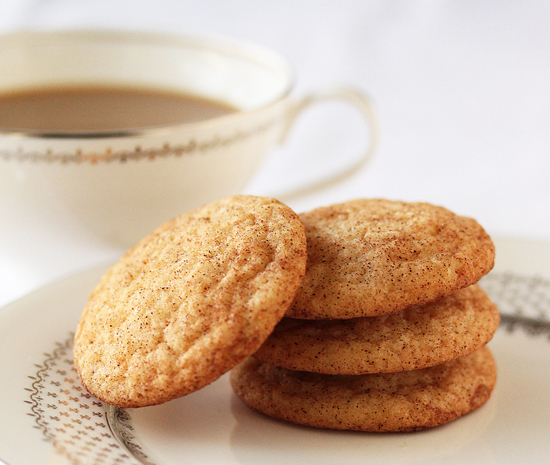 I love the soft chewy buttery interior with the kiss of cinnamon and sugar on the outside. Oh, and I make these all year round. 1. Preheat oven to 400 degrees F. Cover one cookie sheet with aluminum foil, then double pan. 2. In a large bowl, with a fork, cream the butter and sugar. Mix in the cream of tartar, baking soda and salt. 3. Add eggs to the side of the butter/sugar mixture and beat until slightly frothy. Thoroughly incorporate the beaten eggs into the mixture. 4. Measure the flour by dip-level-pour method, adding in three parts, until completely combined. 5. Combine the ¼ cup sugar and cinnamon in a medium bowl and set aside. 6. Make 1 ¼-inch balls of dough, either by hand rolling or with a small ice cream scoop. Roll balls of dough in the cinnamon-sugar mixture and place 12 to 15 on cookie sheet. 7. Bake at 400 F for 9 minutes. Cookies puff at first, then flatten out and become crinkly. These look amazing Lynn, no wonder your son does not want to share. Is that caramel sauce you are serving them with? Double indulgence. I don’t know if I’ve ever seen more perfect Snickerdoodles. A classic recipe. 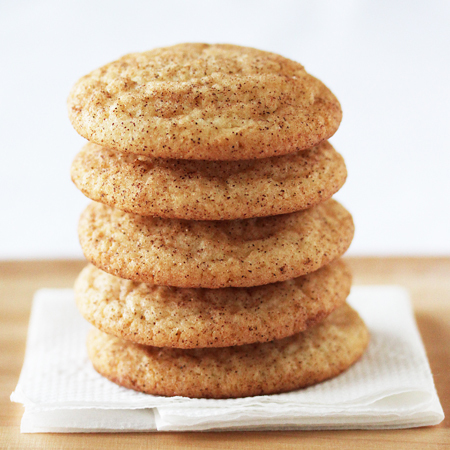 oh…these Snickerdoodle Cookies look so perfect and yummy. I love the way you used all butter now. No wonder they’re one of your son’s favorites. Hm…if second choice is this good…I really want to see your recipe for those Twisted cookies…they sound wonderful too. I have never had Snickerdoodles, but yours look really inviting:) I have three daughters, but I bet my oldest (19) would behave just like your son! I like your square dish – it’s very fitting. Snickerdoodles are also a favorite in this house and I can definitely understand your son not wanting to share. I have a feeling that I’ll be making a lot of cookies like this in the fall when my oldest goes to college!! Gorgeous photos of those cookies!! 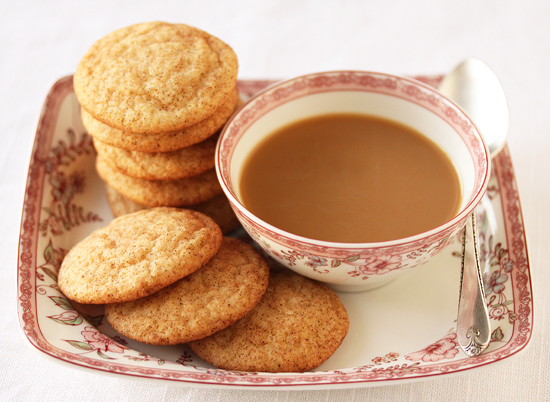 I’m not even very fond of snickerdoodles but your beautiful photos have me craving some very badly. I’ll bet your son enjoyed them very much! Wow! They look so delicious!